So you’re looking to get a tactical knife? When it comes down to it, there are a plethora of knives which are labeled this way. Knowing which are tactical and which are just sales tactics can take a bit of extra knowledge. What’s the difference between passable and great tactical knives? Read on and we’ll make sure that you avoid the cheap stuff, which is the last thing you want in your hands in a bad situation. Tactical is used so often these days in marketing, the word has begun to feel worthless as a descriptor. Everything from cheap five dollar folders to backpacks that fall apart if you fill them can sometimes be described as tactical depending on where you’re buying. For our purposes, a tactical knife is one which can be used as a good fighting knife in addition to being the kind of thing you might have in your EDC kit. As long as at least two of the above are met, you can probably call the knife a tactical knife. The primary purpose of a tactical knife is usually to use it as a tool. They’re generally not dedicated fighting knives. While there are some true combat knives which work okay as tools, such as the USMC KA-BAR, the majority of fighting knives with long histories usually aren’t all that great for much but putting holes in people. The Gerber Mark 2, for instance, is one of the most storied combat knives in the world, but it’s usage as a tool is pretty much impossible for anything but small cutting tasks. Instead, think of your tactical knife as a last-ditch self-defense item that should also be able to handle utility purposes in your everyday life. Knives marketed as tactical have blades ranging from 3″ to 8″. For most people, a 4″ blade is the way to go. It’s large enough to be a practical tool for self-defense in a pinch while also being small enough for everyday pocket carry. The tip is a pretty big consideration for most people. A good folder won’t use a “simple knife” blade pattern. Instead, a drop point, tanto-tip or clip point is the ideal way to go. Spear points are also practical, although it can take a good bit out of the utility of a knife. The most practical, and probably most common blade pattern for a tactical knife is going to be a 4″ drop point. This gives the knife a decent “belly” for slicing while also allowing you to have good penetration if you need to pierce something. One handed opening is also a good idea if you’re intending to use the knife as a self-defense weapon. This can be done either with a pressure point on the back of the blade or through a spring mechanism like many of the knives which Kershaw and Gerber offer. Both have their advantages and disadvantages, but spring mechanisms require less wrist movement to open and are the way to go. The handle is always going to be an important consideration, of course. 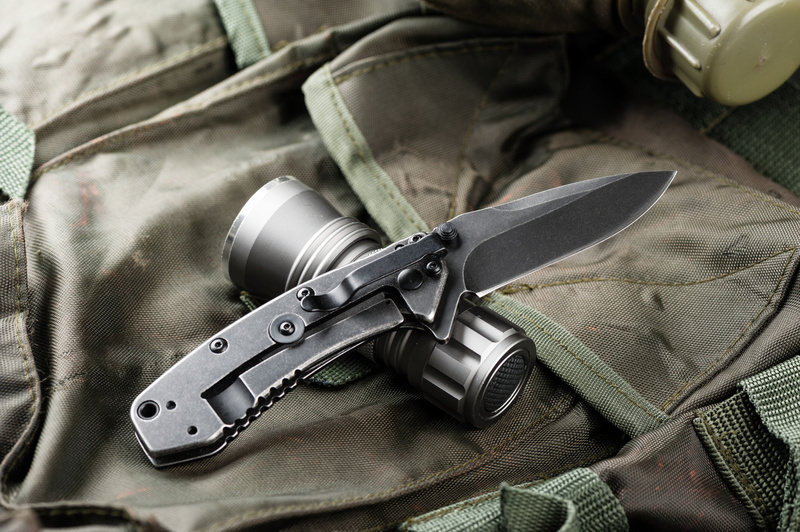 With a tactical knife, you want something strong and durable. Many of the composites and polymers which are offered by reputable companies are just fine. Avoid things like wood, bone, or antler. They’re attractive but have a tendency to warp if you get them wet or expose them to extreme temperatures. Full metal bodied knives are also an option. While some people swear up and down that they slip more, a good checkering will keep the knife in hand in all but the direst of situations. There’s some leeway, but the above should be your primary considerations as long as the rest of the knife is sturdy. What About Fixed Blade Tactical Knives? Knives with a fixed blade that could be considered tactical aren’t really a rarity… they’re just usually sold as survival knives. The idea is similar to what you’re looking for in a folding tactical knife: you want something which is sturdy enough to be a tool while also making a good weapon. Fixed blade knives are always going to be more sturdy than even the most robust locking knife. Something between 4″ and 6″ is good enough for most people. In many places, it’s illegal to carry a fixed bladed knife in a concealed position and anything over a 6″ blade gets a bit too unwieldy for most tool usage. Take advantage of the extras a fixed blade can offer you. A full tang pattern, quick-drawing sheathe, and some kind of cross guard are all great ideas that’ll make a knife more serviceable as a weapon. Clip points are much easier to find in fixed blade knives. A classic-style 6″ Bowie pattern with a full tang is suitable for most tasks, from skinning to slicing meat to being used as a weapon. In a fixed bladed tactical knife the biggest difference between a dedicated fighting knife and a tactical knife is most likely going to be the blade length. You should have a pretty solid idea of what you need at this point: a tool which can double as a weapon. Military-style knives are better for dedicated self-defense applications than tactical knives but tend to suffer some pretty big failings as tools. Tactical knives make the perfect middle ground in this case. A tactical knife should be part of your everyday carry kit, whether it’s a folder or a fixed blade. If you’re looking for suggestions to get you started, then you may want to see what we’ve got waiting for you in our blog.